"The Grand Canyon of the Pacific"
Unfold a map of Kauai, and you'll notice the main road nearly completes a full circle around the island but it's broken in the northwest corner. 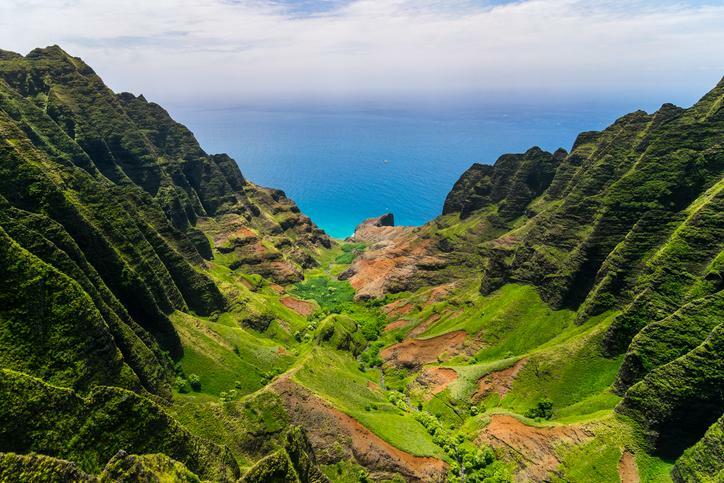 There, where the two tips of the Kuhio Highway end, is where you'll find Kauai's most stunning feature -- the Na Pali Coast. 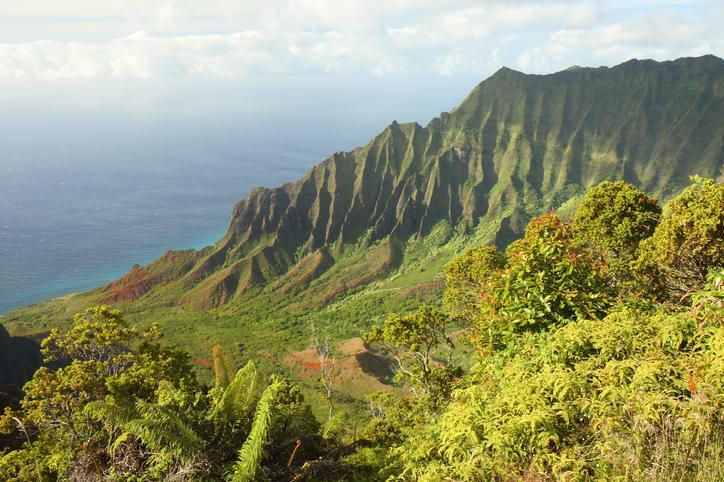 And hidden just inland from the Na Pali Coast is the 10-mile-long Waimea Canyon which is nearly as beautiful. You can visit both on the same drive. Take the Kuhio Highway south and then west to the historic town of Waimea on Kauai's dry west coast. No matter the weather on the other sides of the island, you're almost guaranteed blue skies, hot air and dry temperatures on the west side. You can also find the island's best poke in Waimea sitting in the back of the Ishihara Market. Just after you cross the bridge over the Waimea River and drive past the Ishihara Market, Aunty Lilikoi Passion Fruit Products and the statue of James Cook, take a right onto the Waimea Canyon Drive. You'll drive through some of Waimea Town's neighborhoods before ascending up towards Waimea Canyon and the stunning Kalalau Valley Lookout. The road switchbacks its way up the side of a steep hill where you'll be given impressive views of the town below and the glittering Pacific Ocean beyond. You may be tempted to pull over for a picture, but much more stunning scenery awaits you at the top. As you ascend, the canyon will appear on your right side. 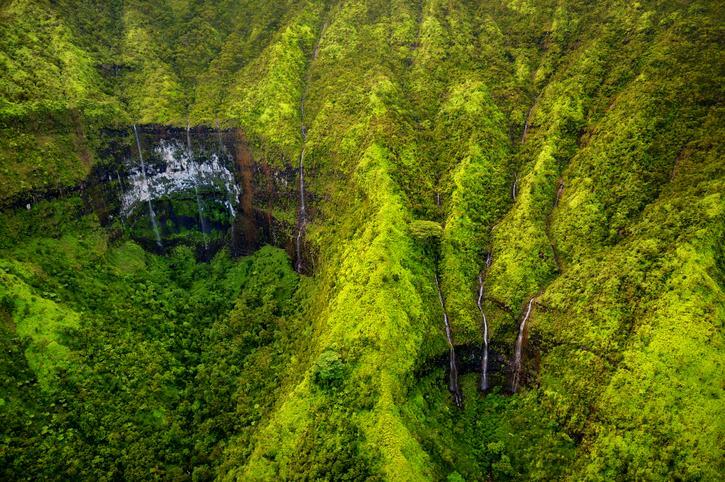 It slowly develops which is apropos -- the canyon itself was carved over millions of years by rainwater flowing out of Mount Waialeale; Kauai's central dormant volcano which just so happens to be the rainiest place on earth. Again, you'll be tempted to pull over for pictures, but your patience will be rewarded. 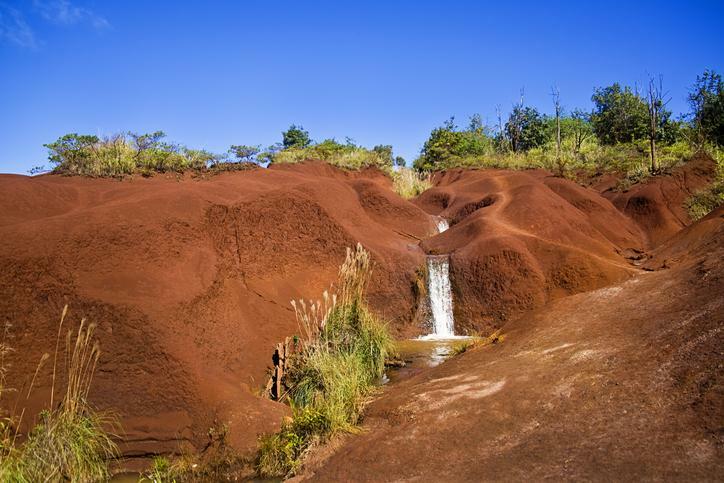 You'll notice a stunning cascade of water carving its way through Kauai's signature red dirt on the left side of the road before the first major viewpoint. It's this erosion that shows you just how the canyon was formed over the course of a million years. It's also a sign of things to come. With Kauai's volcano now dormant, the island will slowly wash away to nothingness just as many of Hawaii's islands already have. This erosion is constantly taking place here in the canyon, in the Waimea River below and in all of Kauai's many rivers around the island. And Kauai has the state's only navigable rivers which means the erosion is happening quicker here than anywhere else. It's a reminder to take in life's beauty before it's all gone. As you approach the first major viewpoint, try to put yourself into the shoes of Mark Twain. More than 100 years ago, back in 1866, he stepped to the edge of the Waimea to grant it the nickname "The Grand Canyon of Hawaii." Now, The Grand Canyon dwarfs the Waimea Canyon in many respects, but it's a suitable nickname when it comes to sheer beauty. Just like the Grand Canyon, the second you see the Waimea, you know -- this is not something you're ever going to forget. 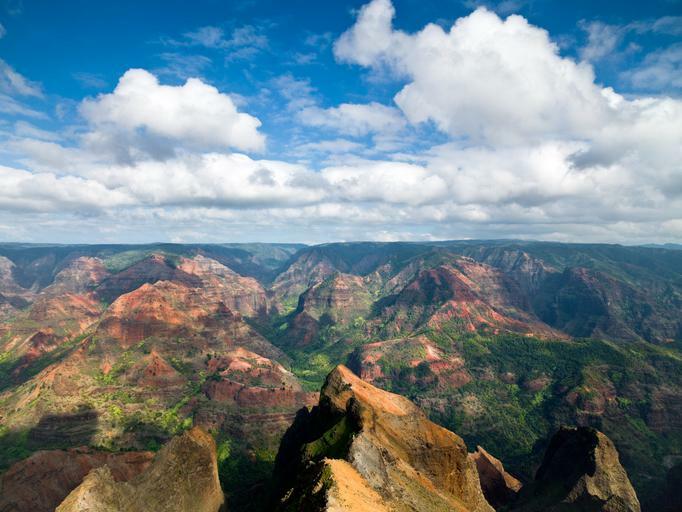 The Waimea Canyon is 3,600 feet deep and it looks different depending on the day. Summer can be dry in the canyon, so the shrubs are lean to expose colorful rock. Winters tend to be wet. That's when the shrubs covering the canyon walls turn green with streaks of red, orange and yellow rock exposed underneath. And moisture also brings with it towering waterfalls that turn to mist as they descend the height of the canyon walls. There are two official viewpoints on your way up the Waimea Canyon Drive, and they are both on your right during the ascent. There are also a few unofficial viewpoints that are worth a stop but only after passing the first official one. Make sure to practice plenty of caution on the cliff's edge as the soft red dirt can give way. That same red dirt can also get quite slippery when wet, and the rubber soles of conventional shoes will provide little traction. Your drive to the end of the road will also take you through a small "town" called Kokee. You'll find a little shop, restaurant and an open park in Kokee. You'll also find plenty of camping sites and a lodge with cabins for rent. Kokee is incredibly popular with tourists and locals alike, so make sure to book any campsites or cabins well in advance. Kokee is also where you're likely to notice a dramatic temperature change. At about 3,600 feet above sea level, Kokee features cool temperatures year-round. You might even find yourself being downright cold in the wintertime, so make sure to pack a light jacket or sweatshirt on your way up to see Waimea Canyon. Drive past Kokee and resist the urge to turn off at the first Kalalau Valley Lookout. Take the road all the way to its end for the most dramatic views of the Na Pali Coast's prized valley. 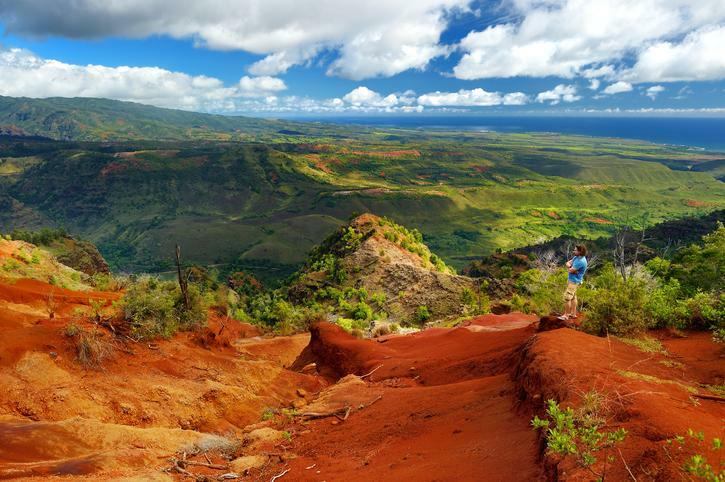 Walk up the short-but-steep concrete path to get stunning views of Kauai's rugged West Coast. You'll want to be at the Kalalau Lookout at the end of the road early in the morning when you're least likely to be obstructed by fog. The elevation of the lookout tends to collect clouds as the day goes on, and you won't be able to see perhaps the most beautiful site in all of Hawaii through a wall of mist. The mist can also make the lookout quite dangerous. You can walk right up to the red dirt edge of the 3,600-foot wall of Kalalau Valley at the lookout. Heavy mist can obscure this edge which can prove fatal. It can also moisten the red dirt to make the edge quite slippery. Take extreme caution near the edge and always keep an eye on any children. This lookout, at the very end of the road, serves as a trailhead for hiking paths that can take you to higher Kalalau Valley viewpoints and Alakai Swamp -- the most elevated swamp in the world with jawdropping views over the north shore. The Waipoo Falls Trail is a great way to descend into the canyon to enjoy its beauty. The trail to Waipoo Falls branches off of the Canyon Trail after it descends into the canyon. You can find the Canyon Trail trailhead at Kokee State Park amongst the yellow ginger plants that give the cool air a sweet scent between mile markers 14 and 15 on Highway 550. It's a moderately difficult two miles down to the falls to make this hike four miles roundtrip. Just remember that the hike back is when you'll be challenged by the ascent out of the canyon, so bring plenty of water. Descending into the canyon takes you through a few climate zones with different flora and fauna. You can also see how each side of the canyon is very different. Everything is well-signed, so it shouldn't be hard to find the small waterfall and its swimming hole. The water flows a bit better during the wetter winters, but the small swimming hole is much more refreshing during summer. The canyon is prone to flash flooding even when the sky is blue. That's because a downstream storm could be raging just out of site to fill the canyon with rushing water. Always check the weather on the west side of the island before descending into the canyon. If in doubt, hire a local guide who will know the best time to take advantage of the Grand Canyon of the Pacific. Should I Go To Oahu Or Kauai?